Mattress retailer Tuft & Needle has created a pillow that utilizes their proprietary T&N Adaptive Foam — a type of foam that is designed to work with each person’s individual body. It’s also the same foam found in the top layer of Tuft and Needle mattresses. The solid-foam-core pillow has a soft, removable cover that you can machine wash.
Who is the best fit for this unique foam pillow? Read on for my full review. The &Pillow is made by mattress retailer Tuft & Needle. They’re a popular bed-in-a-box mattress brand and are well-known for being transparent about their materials and construction. They make an all-foam mattress at a very affordable price point ($575 for a Queen). Their products are designed and crafted in the USA. In addition to the &Pillow, the company also sells sheets, a mattress protector, and a bed frame. You can purchase all products online via their website (and some are available on Amazon). They also have brick and mortar stores in Arizona and one in Seattle. 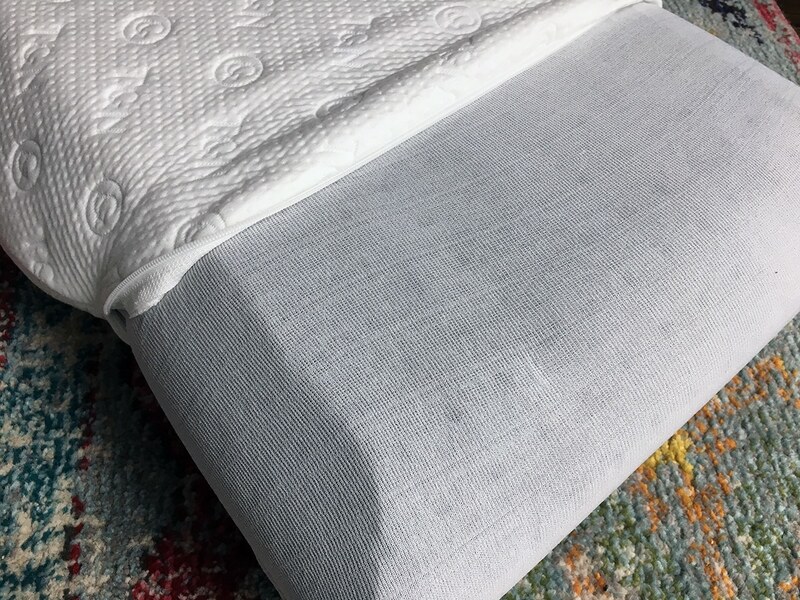 Check out our full review of the Tuft & Needle mattress. The pillow comes in two sizes: Standard and King. Both pillows feature a 5″ height profile. I reviewed the Standard size pillow. Nevertheless, the T&N Adaptive Foam should still have the same benefits and properties as the foam in the top layer of the mattress. Tuft & Needle says they engineered their Adaptive Foam based on customer feedback and that it should contain the best attributes of memory foam and latex foam. It definitely has a lightweight feel that is immediately responsive. The more pressure you apply to the pillow, the more it is designed to react and provide support. The cover is a white knit with a texture and pattern. It’s made of a blend of materials (though more than half of it is polyester). It does include Tencel, a sustainable fiber that is regenerated from wood cellulose. It’s got a similar feel to rayon or bamboo fibers but it’s more environmentally friendly and is known for breathability. As someone who has slept on many foam pillows, I was curious to see what the T&N Adaptive Foam core of the &Pillow had to offer. To me, the light grey foam feels closer to a latex foam pillow than a memory foam pillow. It’s lighter-weight than most memory foam, and your head won’t “sink” into the pillow. It’s immediately responsive but has a supportive feel when you press your head down. It relieves pressure quite well. The outer cover is soft and feels like it’s made of good quality materials. It does have a texture and a bit of a design or pattern on it, so you’ll want to put your own pillowcase over it if you’re sensitive to that. You can easily remove the cover with the zipper on the side and machine wash it on a gentle cycle. It is not recommended that you put the cover in the dryer, so you’ll need to make sure you leave time to let it air dry. 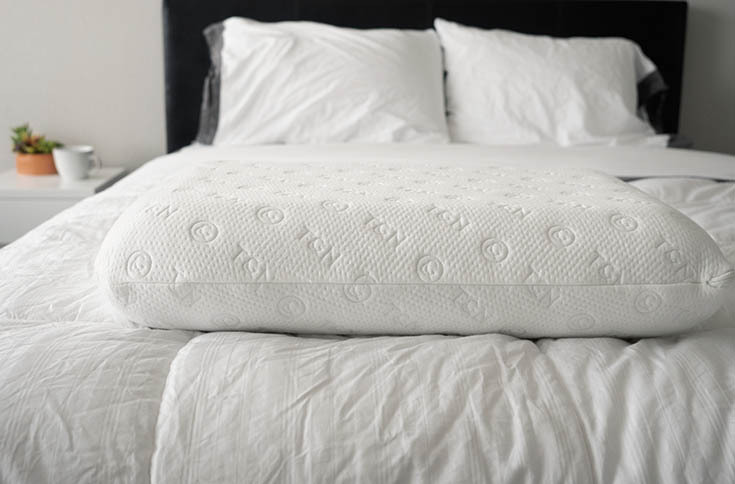 The combination of the Tencel fibers woven into the fabric and the aerated foam core help keep the pillow breathable. Sometimes solid foam pillows suffer from lack of airflow, but there was no issue with this pillow. Based on the 5″ height profile and the overall firmness and feel of the pillow, I think it’s a good option for both side sleepers and back sleepers. This is probably because the foam does a good job of adapting to how much pressure you put on it. I was able to roll from my side to my back and felt that my head and neck were being properly supported in each position. I think stomach sleepers might struggle to find a comfortable position with this pillow. Typically, people who sleep on their stomach need a pillow that’s 3″ tall or shorter. I had a very positive experience with the &Pillow from Tuft & Needle, and it’s becoming one of my favorite solid foam pillows. The ability of the foam core to adapt to different levels of pressure makes it a great option for people who sleep on both their side and their back. In a perfect world, I would be able to throw the knit cover in the dryer after washing it, but it is still relatively easy to clean given that it’s machine washable. I also really appreciate that not only is the foam CertiPUR-US® certified, but the whole pillow is also Standard 100 by OKEO-TEX® certified. I would recommend giving the pillow a day or two to off-gas in a well-ventilated area before use. This should help the initial smell dissipate more quickly. In addition to a three-year warranty, the pillow also comes with a 100-night trial, which mitigates the risk of your $75 or $100 investment in the pillow.